Yeah, I know, I’m a gear junkie. Sometimes when I see something cool I just can’t let it pass up. And that was a case with Bond-Vox HALO carabiner. 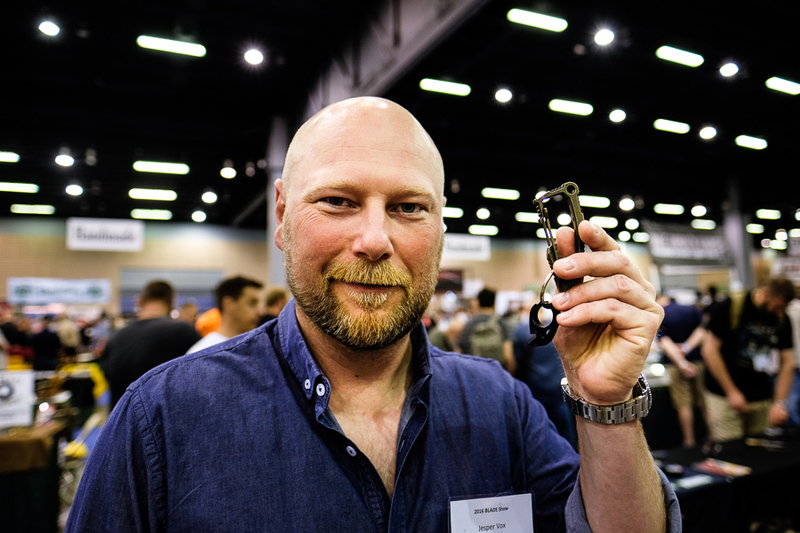 It’s been not officially released to public yet but when I spotted first prototypes in Jesper’s hand at Blade Show, well… I checked my $$$ supply and 3 minutes later I walked away with thinner wallet in one pocket and 3 HALO prototypes inside the other one – titanium, bronze & acid washed bronze. Now, after almost 2 weeks, I think it’s time to share some initial thought. First of all it’s such a cool looking design! 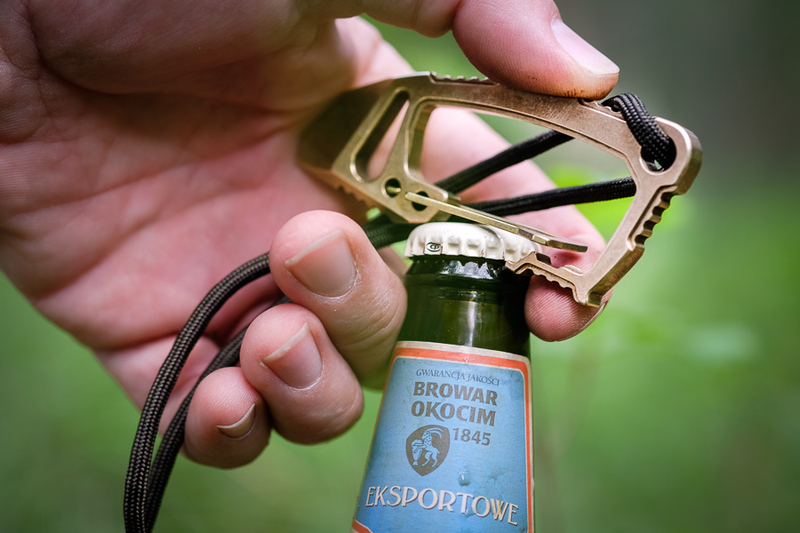 It’s bold and rather substantial piece of gear (for a carabiner). Below my picture of all 3 of them. 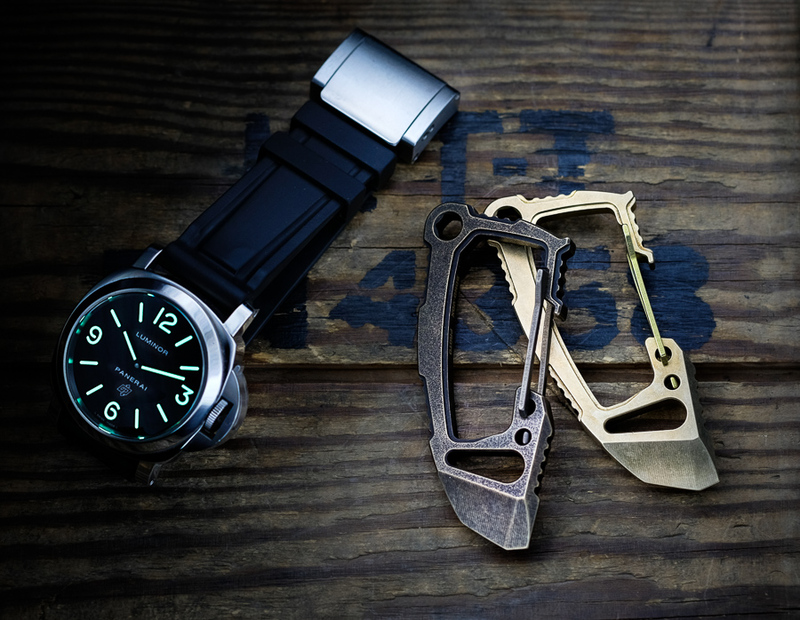 Brass is nice, bronze one would be surely MadMax's gear of choice, and Titanium is just tough and lightweight. 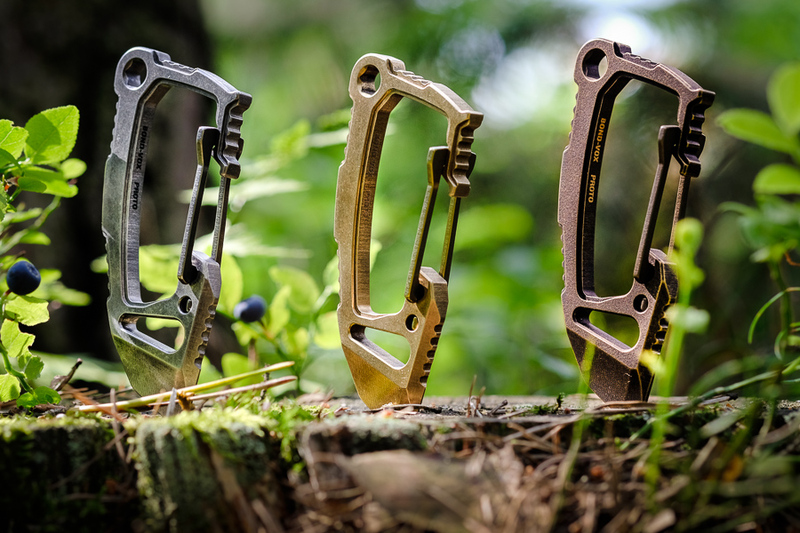 There is a considerable difference in weight between Ti and other versions – it’d good for EDC, but bronze has one serious advantage and I’ll touch that later. 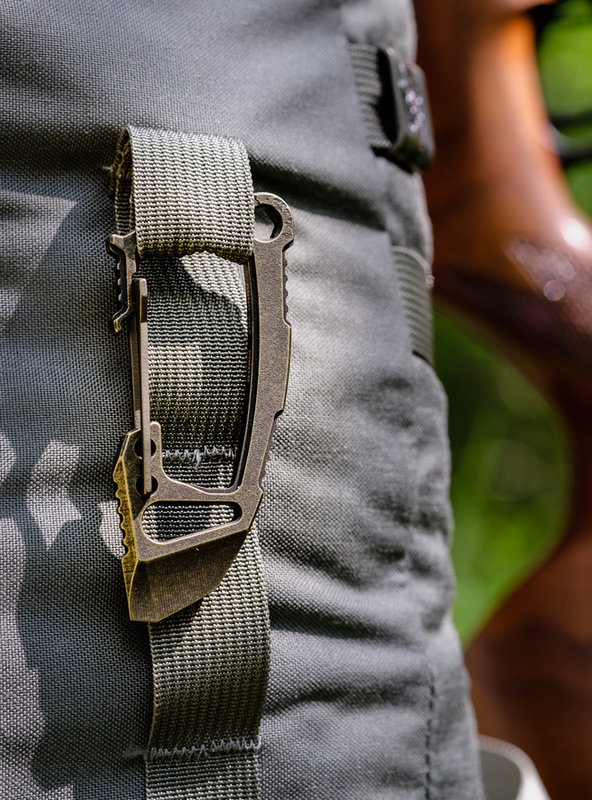 HALO is a Key-ring of course… actually you can use both front slot (pictured) and hex hole as key attachment point. After couple of days of carry I prefer the latter actually! First of all when I snap it on my belt loop it is in more secure position. And also gives me better access to the ‘multipurpose blade’. That ‘blade’ is not sharpened of course, but it works great as Box Opener / Tape Cutter / Prybar / Scraper / Flat Screwdriver (rather big screws, but still) / Philips Screwdriver (when canted). Cutting through packing tape with your keys is a big no-no so box opener functionality is really key feature for me. Glue residue on actual key (from a packing tape) attracts dirt & sand and can destroy a precision lock in your car or home. So yeah, it’s handy. Scraper & big screwdriver functionality is self-explanatory. 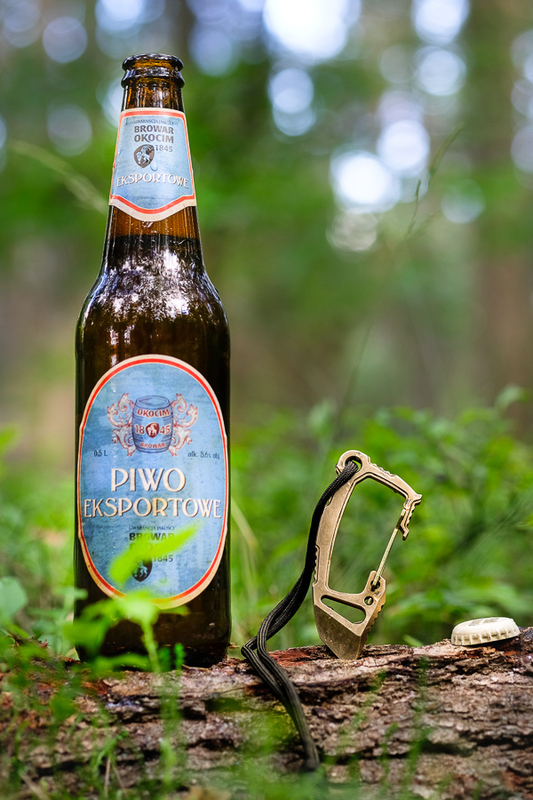 Now Pry Bar… that is awesome! 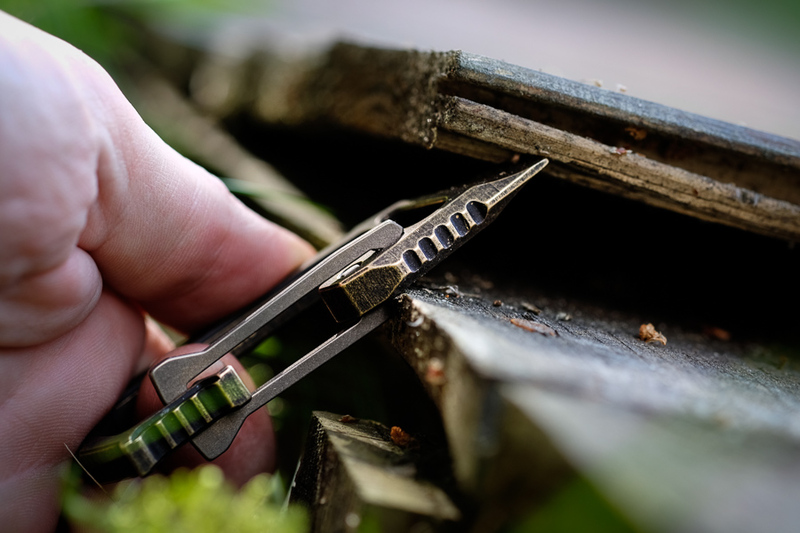 Just ask yourself how many times did you pry something with your key or knife? 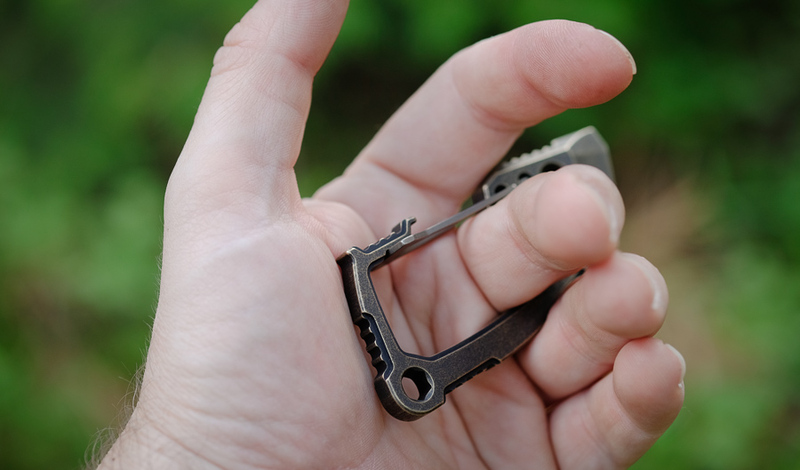 I’ve seen a lot of snapped points of fine folders on the forum – tool like HALO carabiner is a much better mini pry-bar. And with the length of nearly 9cm (3.5”) is not so small at all. I was able to pry-off a board with it last weekend. Shackle-key… that thing is really big for me. I’m a sailor, actually I’ll go sailing with kids later on this summer. So a shackle key, which I can snap-attach to my sailing shorts is just awesome news. All the materials are quite resistant to sea water but I’ll surely take bronze one with me so it’ll get some nice natural patina. Of course I’ll follow up with pics when I’m back! Hex Driver is quite obvious. What I like about it is the fit – it’s perfect! My tools sit firm enough so that they won’t fall out of the socket. But also I think the shape is just slightly conical, so you can put some pressure on the screw when using the carabiner as a lever. 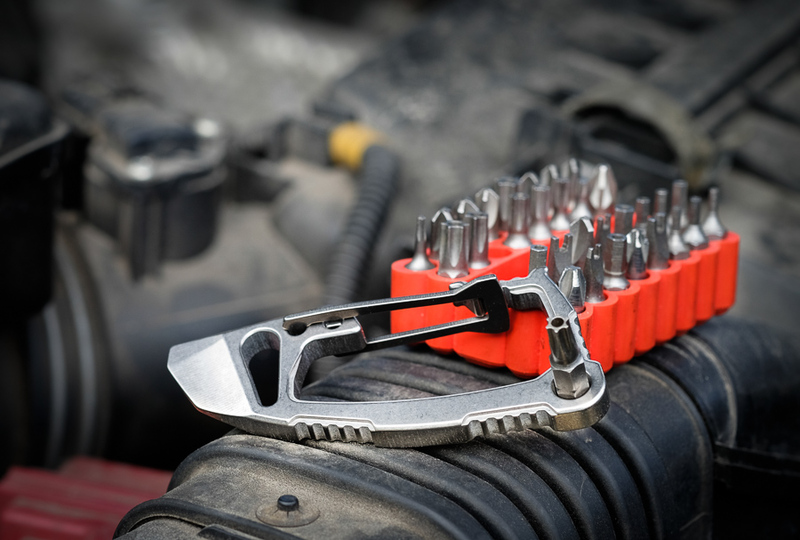 BTW, it’s also quite a leverage / torque compared to standard screwdriver with bits. 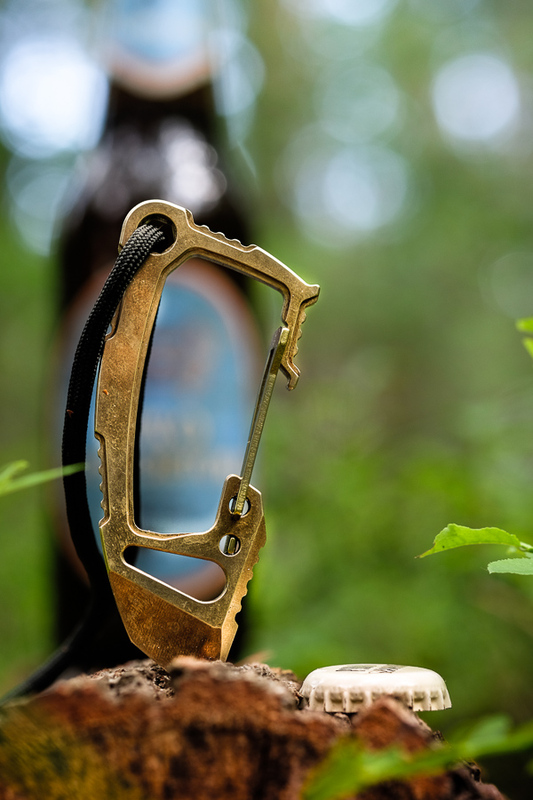 Finally a multitool carabiner with a true self-defense option if needed. Yeah, it’s big enough to put a finger in it and to push it against the thumb base inside a palm. And with keys attached to hex-loop it can be grabbed like that with keys on. 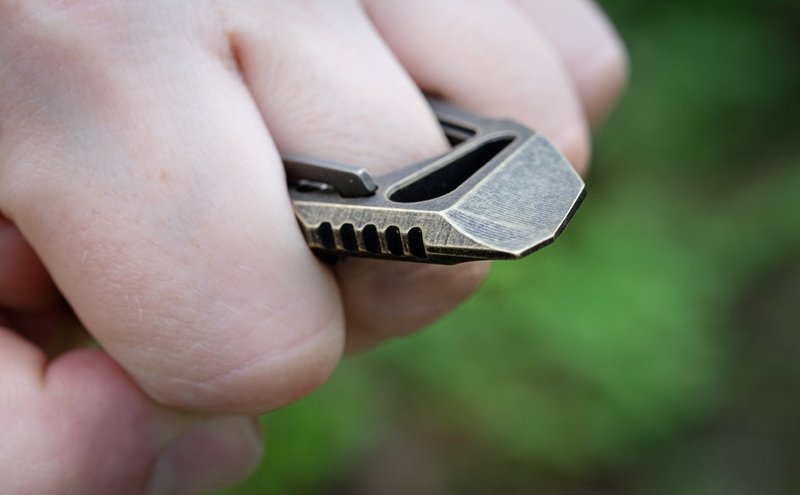 Some self defense gurus recommend even to use actual keys as a last-resort improvised punch… now compare it to this! Of course I’d use it only as a 'last ditch' defense tool, but sometimes (especially when my family would be involved) there might be no other option. I’m not sure if it was designed with SD option in mind, probably not. But it certainly would do the job as an improvised weapon. As you can see in some pics I was able to drive it into a trunk of wood. Also this is where the weighty bronze HALO comes as a real advantage... more mass -> more momentum -> more impact power. 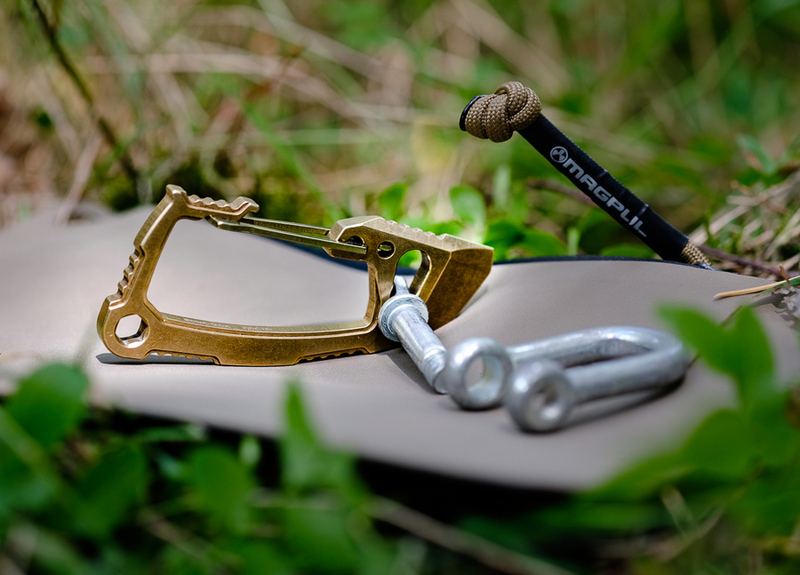 And last but not least… it can be used to hang stuff on it – it’s a carabiner after all, lol! 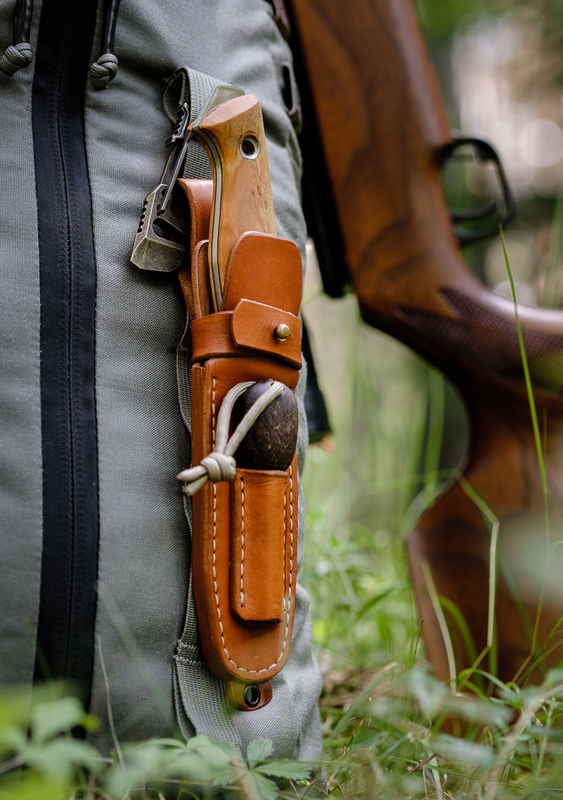 It fits MOLLE on my backpack, which is a good news if you’d like to attach something, like this Helle Utvaer knife. 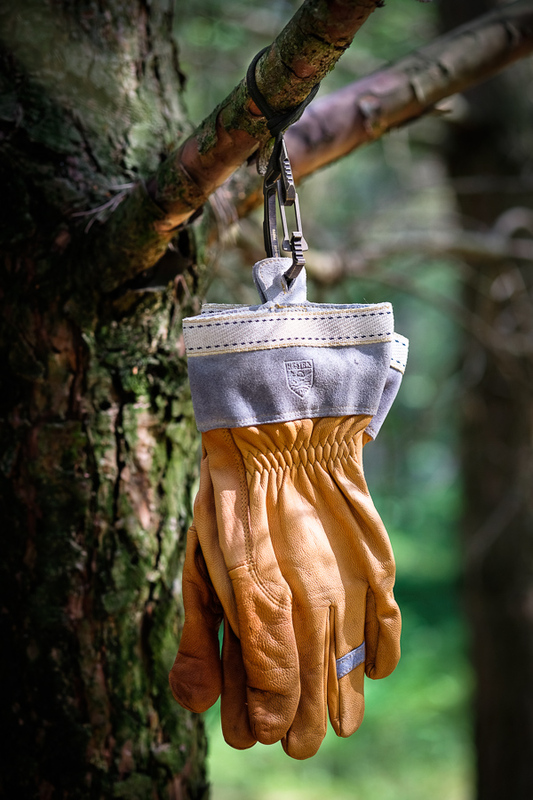 Paracord, outdoor gloves, metal cup or wooden kuksa, hat, sandals – you name it! 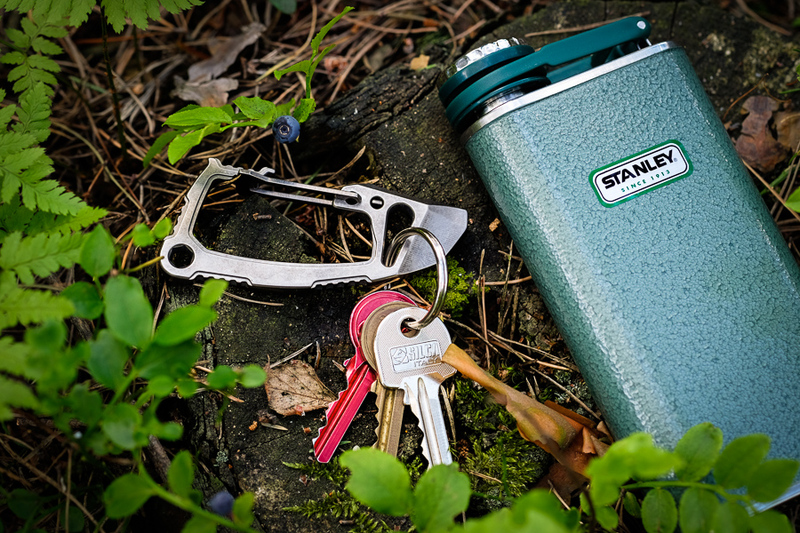 Carabiner is one of the ‘good to have around’ gadgets and if it can serve more than one purpose – it’s even better. Copyright © 2019 Ti2 Design. All rights reserved.